In every discussion I’ve had about travelling with young babies, somebody will say, “Oh, babies are so easy! You just put them in the stroller/carrier and they sleep while you go sightseeing!” My policy is to take an immediate, strong, and largely unfair dislike to these people. I’ve heard of settled babies who take the world happily in stride, then conk out for a long, predictably-timed nap, and of course their parents don’t need to take the sorts of precautions I’m about to suggest. I’ve also experienced (don’t hate me) the joy of an alert but calm child, which still makes for pleasant journeys, even if our down time never amounts to more than twenty, randomly-dispersed minutes per day. But this one’s for the kids who can’t contain their excitement, are unable to filter the overload, and have a nasty habit of combusting spontaneously with the slightest ignition. 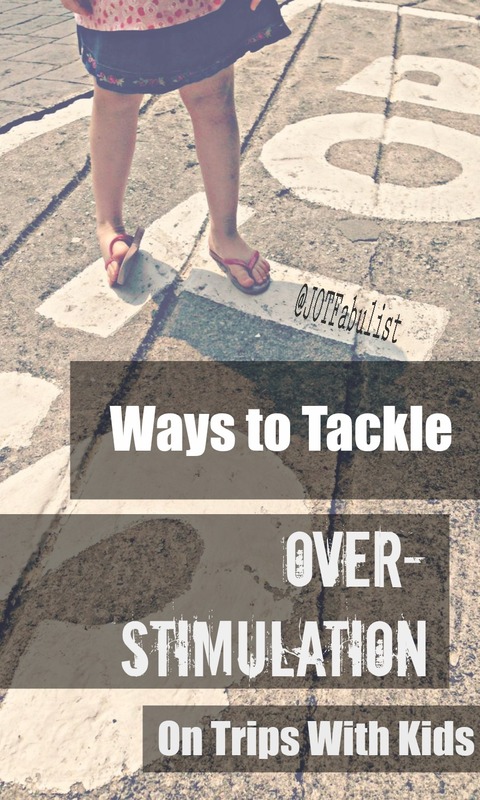 Here’s what we’ve learnt about managing overstimulation, without resorting (well, barely resorting) to actual sensory deprivation. So let’s kick off with the sensory deprivation. I love a good, bustling city, but what I really love is not having to spend my whole holiday coping with an adrenalin-fuelled child, especially in meltdown. Have you ever been tempted to shout, “Head for the hills!” when a two-year-old starts a tantrum? Now’s your chance to take that literally. It’s exhausting for a toddler to do a brand new thing every day, but much less tiring to visit the same attraction for a second time. We’ve developed a fondness for places which sustain multiple viewings. This is easy with attractions like big, city gardens which have free entry (plus or minus small fees for special areas or activities to add variation to each day), and you can always spend just one more afternoon at the beach/on the ski field. Large museums, big, historical buildings, and hop-on-hop-off bus tours can also work if you watch the ticket prices. Failing that, try cultivating an amateur interest in photography, videography, sketching or sound recording. Then you and your toddler can both spend hours (if not days) examining the same, compact scene from every conceivable angle while your travel companions grow increasingly frustrated and restless in the background. The sights may be new, but that’s less of a problem if they’re anchored in the familiar. From keeping usual meal times and bed times (helps to stick near your own time zone), to bringing favourite toys and books, to following the little rituals that accompany each transition, there are many ways to help a child gain respite from the strange. And games, too! Remember there was that whole thing on games for this. Let’s pretend you want to see something crazy-exciting. Is there a reason you have to all do it together? Maybe the more intrepid travellers can go one at a time and compare experiences later, allowing the less intrepid to laze peacefully by the pool, not threatening a meltdown. Want company? Travel with more people and you can split into whole subgroups. Travel with certain people and you’ll feel glad to just leave the hotel. Restaurants can be busy and noisy, and foreign ones can serve weird food. When we travel, we aim to eat out only once a day, with the other meals eaten at our accommodation or the park. Some days we’ve eaten serially, with the non-eating parent walking “junior” around outside, then swapping over. Returning to the same restaurant each day can give an extra sense of stability, plus an extra sense of welcome, depending on how you tip on the first day. We also allow the kids to order food they’re familiar with. Never let it be said that you can’t live on bananas, toast, and boiled eggs for a week. P has done it. A stroller-friendly child may need a carrier. A walking child may want a stroller. An independent sleeper may want a spot in the same room, or even the same bed. Spoon-feeding may make a reappearance. I swear letting them wear their favourite shorts for the entire holiday can even help, although my real motivation that time was accidentally forgetting to pack P any changes of shorts. In any case – expect clinging. Be ready. Go with it. Use special equipment where necessary. It won’t last forever. Most parents already plan rest periods into their normal days, and it won’t be too much of a stretch to extend this practice to vacation time. Booking a well-situated hotel (close to sightseeing and transport) makes this easier, as does staying at a place with a garden, pool, or just a living room. Failing that, it’s handy to develop a mental model of the city built around parks and green spaces, for pit stops. Overnight, ear plugs, designated sleep-ins, apartments or adjoining rooms, cosleeping– well, as far as I’m concerned, just whatever. Then there’s the old tricks – tight wrapping or tucking, white noise recordings, and black-out blinds made out of blankets. In other words – lots of sensory deprivation. Last time we had one of these discussions I ended up with even more tips, which is great, because I’m the kind of person who forgets to pack shorts for my son. What did I forget with this post? Amanda (from Happy Sensitive Kids) alternatives busy days with quiet days, avoids short/whirlwind trips to allow settling in time, and often chooses the same holiday destination year after year to give that sense of familiarity. Leila (from Sensitive And Extraordinary Kids) votes for self-catering all the way. Danielle (from Bubs On The Move) only ever plans half a days’ activities at a time, leaving the rest free for lingering or down time. Julieann (from Browsing The Atlas) notes that a balcony can also serve as an extra living space for some down-time. Joy (from Joy Loves Travel) reports that the unwillingness to try new foods gets better after six or seven years of age – in her experience. Hurrah! And let’s hope we’re the same. Four Meltdown Triggers to consider when planning a family holiday. 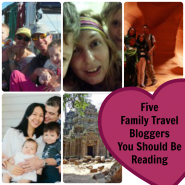 Find more posts on travel with sensitive children. I am pouring over all your posts now in anticipation my my big trip next week. !! By the way I’ll be in Singapore in Jan will you be about? Have fun on the Big Trip. We should definitely be in Singapore in Jan. Drop me a line and we can do coffee! Great advice! Our 4-month-old baby son gets overloaded just being at his Chinese grandparents’ place (we don’t need to travel to get him overstimulated). We live close-by and sometimes go there to have lunch together. But when our baby’s tired, it’s really hard for him to fall asleep there. The place is little, has a lot of colours, patterns and other stuff that distracts our little one from falling asleep and my father-in-law has a loud voice and likes to play with him (he probably forgot that babies need some downtime). I usually take our son outside which immediately helps him fall asleep. My father-in-law always tells me that it’s way too cold to take him outside (just like almost any other Chinese person does), but he just loves fresh air and a quiet garden. True! You don’t have to take them far to get them over-excited! I think people do forget (or underestimate) how much they need to sleep at that young age. Funny the “too cold” thing. I was always getting told to rug my son up against the “winds” or the “cold” in Singapore – and you can imagine exactly how “cold” it gets here! Good list of suggestions! I think our kids are pretty much the norm, not overly sensitivity but kids who get tired, insecure in new settings, have the need to roam freely every now and then, don’t always sleep quite long enough in new settings… but they can also get excited by exploring, find airports and train stations exciting enough for sights of the day, they can take a small dose of something adults want to see, they can (and need to learn) behave in a restaurant occasionally. But them making us slow down and not jam pack our days has been only a good thing for us too! We should use the exoring the same thing deeper more though, a new but good idea! All small kids are sensitive to some degree – they haven’t got that self-control or rational thinking which allows them to tolerate discomforts. Although from my two I can say some of them are definitely less tolerant than others! Exploring the same thing over more than one day has definitely worked out for us. The tension then is that I always want to see the next thing so I probably don’t use that one as often as I could or should. Probably the most common way we use it is when we go back to a place for a second visit – the kids always want to start with what they did last time, and it really helps them settle in to allow them to do that before trying anything new. That makes total sense! Just think of how many times kids can watch the same DVD.. of course they’d get settled by the reassurance of the repeat even in eg a big museum! Now that I realise it, it will still be a bit of a balancing act on what I’d like to do and what they’d benefit most of. But as you suggested, we also often use splitting as an option when we ‘d like to see something our kids are not up for any more. Btw, when I last summer flew to Bavaria with the kids to catch up with my husband over a long weekend, after a few full days I returned with them to Munich and spent the last night before the flight home there. I had checked out where the playgrounds are, thought we could easily explore the walking zone a bit, maybe go down to the river. When we arrived by train, first the kids wanted to sit down and watch the trains in the big station (I didn’t oppose, there was wine…), and then they didn’t want to leave the hotel room (with the rain pouring, I wasn’t overly keen either but thought I’d have to keep our sanity). But they had had enough of new stuff. So we spent the night making helmets and hats out of tinfoil. And had fun and slept well. Goes to show that the “rules” aren’t what they’re cracked up to be. Clearly Finnish children survive just fine! I was just theorising with Madhu that the people I’d “heard from” about these babies were actually trolls on internet forums. But I guess we can also add bare-faced liars 🙂 . No, I have seen one family whose two babies were like that. Saw it with my own eyes. It was weird, though. Great post! We always plan so that after a busy day (like a zoo, theme park etc) we have at least one quiet day after. That way overload is prevented. Being out in nature helps my little ones a lot – the woods, a beach. They have so much fun but aren’t overwhelmed by crowds, noise and general rushing around. Having loved things from home like a cuddly toy, story book is a huge help. A little bit of home whilst travelling is very calming! That’s a good one. Alternate busy/quiet days to give enough catch-up space in between. Definitely one to remember – thanks! It’s funny how natural settings can be so much more soothing than even quiet city spaces. I guess some part of our brain is hard-wired for it. These are great tips. I haven’t travelled with a young child in a while, but remember a trip we took to Florida when my daughter was 2yo. We unknowingly booked a room with a balcony which was perfect during nap time. She laid down and slept and we sat on the balcony sunbathing/reading and no one was disturbed. Sounds like a comprehensive list Bronwyn. I could have done with some of these tips way back when. Is it normal for babies to sleep through sightseeing sessions every single day? I honestly don’t know of any! Maybe these people are just trolling the internet. I have to admit I haven’t seen it in real life – only on family travel discussion boards online. No wait, actually, I did meet one woman with these amazing sleeping babies. She visited a get-together for the pre-natal class just before P was born. The midwife taking the class was very firm about the fact that these children weren’t normal. But apparently they do exist occasionally! I think you’ve got it all covered! Totally agree with what you said in point 6 too, the key thing is it won’t last forever! I take exception with those smug sorts who have a baby that sleeps anywhere. We had one who never slept EVER. The sleep deprivation while travelling never affected us, the zombie like state of feeling jet lagged became our norm (for about 6 years). The food thing was always an issue though, variety never worked and we ended up always trying to stay somewhere with self-catering facilities – we still do this even though the food fussiness has (mostly) passed. Perseverance is key, there is light at the end of the tunnel! Now one thing we are sort of hatefully smug about is both our children are great eaters. Do you think this comes on holiday with us, though? No. Nuh uh. I really get a taste of what parents of fussy eaters go through when we pack our bags (except I don’t because I know we’ll only be gone for a week or two and neither of them can malnourish themselves in such a short period so I just ignore it and they start eating just fine again after we get home). Your food fussiness has passed, though. Is that at home AND away? He was never too bad at home – all fruit and veg was always fine, he just didn’t like any fancy stuff (the stuff that makes food delicious). We had a few rough times – mainly in France where everything came covered in sauces (delicious ones) but like you I just ignored it and let him eat bread (or cake!!) and plenty of ice-cream. He’s better and more adventurous now at home and away but just not too interested in food generally (except if it’s chocolate)! Meal times take rather a long time in our house. Well I’ll look forward to slightly more interesting culinary experiences in future. Thank goodness for those crowd-pleaser restaurants which serve a combination of local and “tourist” foods, is all I can say in the meantime! I think I’d cry if we were in Thailand and all I could eat was bad pizza! It may have been difficult to tear my nose out of my book. On the other hand, I probably had plenty of good reading material on me. Great tips Bronwyn! Whenever we go somewhere (which isn’t usually far from home!) I just try not to expect anything and just hope for the best! Cos when I plan it usually gets derailed and we tend to veer off from the itinerary. And pack extra patience all the time! Cool post Bronwyn. I don’t have an smallcholdren abd yet your tips make perfect sense. it could alos be used to travel with individuals who are touchy about travelling – with few modifications, Thanks so uch for the info. As an aside, I recently did a couple of guest posts and i would be honored if you had the time to drop by for a read; one at Cordelia’s Mom http://cordeliasmomstill.com/2014/11/06/serendipity-guest-post-by-paul-curran/ and the other at Mindful Digressions http://mindfuldigressions.com/2014/11/06/of-breasts-and-bananas/comment-page-1/#comment-20970 thanks so much Bronwyn. As far as commenting today I have to say gushing support for the above advice. In terms of adding more – we try and only ever do a half day of activity when travelling (and even on weekends at home.) This usually means heading out at 1130 after my baby’s first sleep. There is no point, ever heading out before the first sleep. The day just deteriorates into a heap of tears for all. When my eldest had dreadful sensitivity to noise we travelled with a set of aviation headphones. He rarely used them but on the odd occasion when all the stimulation was just too much taking the noise away allowed him to enjoy the rest of the party. He actually attended a Wiggles concert wearing the headphones and barely able to hear a thing, but had a wonderful time. Aiming for only half a day is a good rule of thumb I think. And you know how easy it is to underestimate the time needed to do something when you’re not familiar with the destination/transport system/language/etc. Thanks! I think you’ve covered the essentials! When we look for accommodation, we try always try to find one with good spots for resting and unwinding (big enough living room area, garden, whatever) and an equipped kitchen so that we can have breakfast and dinner there. In the few instances we couldn’t find a place big enough, the kids went crazy. We went crazy. We were all crazy! We’ve found it to be important to have a place that is comfortable enough for all of us in case we had to be there for a few hours a day. And ear plugs. Never thought I’d need earplugs. And then we went to Melaka. Accommodation is quite limited there, so we had to stay in a very small hotel room. The toddler decided to wake up in the middle of the night and scream for HOURS! And there was no escape from that. Ear plugs are now on my list. Don’t tell me I thought of everything, though? That never happens. I really think you did? I’ll try to go over our summer trip to Italy in my head and see if there was anything else. And yeah, apartments! Airbnb is the only way to go for us (unless we’re going to Melaka… although I did find some places… Sketchy? Yes, but I’d go for it when the kids are older). Tell me if you think of anything. I know you’ve definitely had experience at this, that’s for sure.